Compared with some animal species, the life expectancy of domestic cats is relatively long, and, thanks to advances in medicine, is only going to increase. On average, cats will live 12-15 years, with some entering their early 20's and beyond. A one year old cat is comparable to a 20 year old human, with every subsequent year adding four years to its human age equivalent. Therefore, a cat that is 16 years old will developmentally be the same as an 80 year old human; in fact the oldest cat on record lived to the grand old age of 38, equivalent to 168 in human years! So, we know cats are long lived. Indoor cats, especially. But, like us, they do age and undergo change. This usually happens above the age of 10, when your cat is equivalent to 56 in human years. Their metabolisms slow, their joints stiffen, their whiskers turn grey and they can no longer do, or eat, the things they used to enjoy. As an owner, it is difficult seeing this change, but maturity is just another stage of development and, while it usually brings some detriment, there are ways to manage its effect for the comfort and longevity of your cat. Learning about the golden years early will help you to identify changes when they occur, so that you can distinguish what is normal from what is cause for concern. During ageing, various changes occur. Activity levels decrease, muscle tone reduces and there may be a degree of sensory loss. Appetite and fluid intake will change, along with bowel and urinary systems function, and the immune system may weaken. A cat's physical appearance i.e. coat condition, is also likely to deteriorate, and behavioural/personality changes will be evident. Age associated disorders such as arthritis, kidney disease, and diabetes become much more prevalent after 8 years of age, so it is important to be aware of these. It is also important to keep on top of vaccinations and flea and worm treatments as, even though your cat is ageing, it is not exempt from these problems. 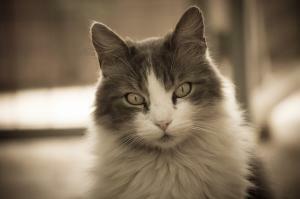 While most considerations for the older cat are fairly obvious, it doesn't hurt to be reminded. Sometimes, it is the little things we haven't even thought of that make the biggest difference to a senior cat. Things like where we put the litter tray and how much we feed our cat are important as it enters its twilight years. In the wild, cats are most vulnerable when they are eating, sleeping, and going to the toilet so having their wits about them is essential if they are to avoid attacks. As cats age, they are less vigilant to threat and cannot react with the same speed as when they were younger, so having the litter tray outside, where the cat is going to feel most exposed, may discourage it from going there. This also goes for the food and water bowls if they are usually placed outside. Move them in; while this will encourage your cat to visit them, it has the added benefit of allowing you to keep an eye on your cat's eating and drinking habits every day. Bear in mind what your cat is eating and how much it is drinking. Cats are notoriously bad at the latter and therefore need as much moisture as they can get from their food. Elderly cats are very prone to dehydration as they have smaller appetites and therefore consume less water. As cats age, they need to keep their weight up and maintain an ideal body mass. While gradual weight loss often goes hand in hand with ageing, it can also be the first sign of a serious illness, such as cancer, diabetes and kidney disease. Any weight loss should be investigated by your vet before a diet plan is made. If your cat is eating less through natural ageing, try to encourage smaller meals more often. Choose a quiet area to place the food bowl and experiment with familiar and unfamiliar foods to tempt your cat's appetite. Some older cats, especially those with dental problems, may prefer a softer food than regular biscuits or hard chunks. Also, remember to clean your cat's teeth regularly, as wet food can leave soft deposits along the gumline, leading to tartar and plaque. Add a little extra water to the food to help its passage through the digestive tract and keep your cat hydrated. Most cats have a favourite spot they like to sit and observe from. Unfortunately, as cats get older, accessing these places becomes impossible. Give your cat a helping hand by placing a ramp up to the sofa/windowsill/bed to assist arthritic joints and ensure your cat still gets to enjoy its treasured lookouts and chillout areas. Also, consider where you put the litter tray, food and water bowls, scratching posts and cat toys, as elderly cats tend to have a hard time getting upstairs. If you notice your cat has become a bit sluggish, move these things to somewhere more accessible. If a bed is placed up high, move it somewhere lower down so your cat can rest without having to struggle. Likewise, consider horizontal rather than vertical scratching posts so your cat doesn't have to stretch. Ageing is a completely natural process and it neednâ€™t be traumatic. By understanding how your catâ€™s needs have changed, just as they did moving from a kitten to an adult, and modifying aspects of lifestyle, diet and care, you can reinforce and maximise health, whilst maintaining a good standard of living whatever your catâ€™s age, requirements, and personality. Unfortunately we lost our elderly cat Bob who was 19 a few months ago. Having being diagnosed with diabetes nearly 18 months ago it was kidney failure that took her in the end, ironically her last blood test showed that she was actually in remission from the diabetes.We were very unsure of how we would be able to manage her condition with twice daily insulin injections and regular glucose curves, alongside a special diet and watching her behavior for ups and downs! But we managed and it fitted into our routine in the end, I think the thing to be mindful of with elderly cats is that if you notice any small changes, appetite, increased fluid intake or they generally just don't seem their selves take them for a check up with the vets. At the end of the day you know your pets better than anyone. We still have her sister Vic who is a lovely old happy content cat. We had a recent scare with her health, she had to have a chest drain due to a build up of fluid on her lungs caused by her heart not being as efficient as it should be due to her senior years - however she is now on daily medication and is doing really well. Just a few tablets at tea time and her condition is easily managed. It can be scary at first caring for an elderly animal who has a health condition but with the help of a good vet when needed and lots of TLC from us their owners it can be really rewarding. My best friend turned 20 at the end of March. Ikee has been in renal failure for over 3yrs now and is arthritic. I had a slight scare in February, she couldn't eat and her face swelled. The vets I visited were not empathetic, and failed to diagnose her problem. My gut instinct was to see another vet, where a dignosis was made; Ikee needed dental surgery. The tested her kidney function and to all our surprise only her creatinine levels were slightly elevated. They supported her through surgery, she is now eating me out of house and home. I feed Ikee Applaws as I feel it's vital she maintains muscle, although this is against advice of a kidney low protein diet. Considering her kidney function test, I must be doing something right. Up until her op I was giving her Dr Mercola Krill oil for pets and Rubenal 75, unfortunately when I administer these supplements she has diarrhoea. Ikee has always been very vocal, with age her vocal range has increased along with the volume. I'm regularly woken at 5am with a constant low meow. Ikee also likes to shout at me till I have a shower, after my shower Ikee receives a teaspoon of coconut oil. I comb her regularly to prevent her fur from getting tuffty, which helps to maintain a soft shiny coat. Ikee has two pillows by the bed to help her jump up and wake me up, head butting, kissing and meowing in my ear. I feel very lucky to have such a special friend still in my life, and as other say she eats better than I do... Only the best for my Ikee. I am sorry to hear about Bib but what a privelige to keep a cat to 19. I have 2 cats, 1 is 16 & the other 15. I have had problems recently with both of them. Kezzie the 16 year old had cat flu although she is an indoor cat and had to have a course of antibiotics which has made her a lot better. Mollie the other one, also an indoor cat had to have 6 teeth removed and has gingivitus which causes her problems off and on. We have had 10 cats over the 44 years we have been married and undoubtedly these 2 wont be our last. I have just written a book on all 10 cats so I have a permanent record of them all. I'm currently caring for two elderly cats (19+) both of whom have mobility problems that mean their back legs aren't as strong as they were, although they can still get about. A while ago they were both struggling to poo and their poo was infrequent and very firm. This problem was relieve by softening their poo with lactulose (3ml per day in 3 doses worked for them) and now they find it much easier to go and are much happier as a result. A lot of emphasis is placed on what elderly cats eat and drink but it's equally important to keep a close eye on what comes out the other end! I have three boys, two are nearly 18 and our other is a relative youngster at 8. Apart from a recent bout of Salmonela, when they were all very poorly indeed, they are all (touch wood) really well. Jess, one of my old boys, was diagnosed with kidney failure over ten years ago and the vet was not very encouraging as he said he could not be operated on as he also has a heart murmer. Since then I have given him reiki healing on an almost daily basis and he has never had another relapse. He does however demand reiki off me on most days and is sprightly enough to jump onto my bed, which is quite high. The others have reiki too whenever they look a bit under the weather or demand it off me. I am convinced it is what keeps them all going. My girls were both over 20 when they died. Like Candine, I also give my cats Applaws for senior cats, as I was told that their bodies have to work harder processing cereal based foods and they all love it too. I'd thank to thank Hannah for her lovely and very informative article on elderly cats. My elderly lady is sometimes a bit wobbly on her feet when she gets up, which always gives me a scare. However, once she is satisfied that she has terrified me sufficiently, she will zoom up the stairs or climb onto the mantelpiece! I was very impressed when our vet talked to us about high blood pressure in cats. Cristal was tested in just the same way as humans and now has half a tablet of Amlodipine for high blood pressure every day. In the past I lost cats suddenly due to stroke. Thankfully veterinary medicine has advanced and continues to do so.